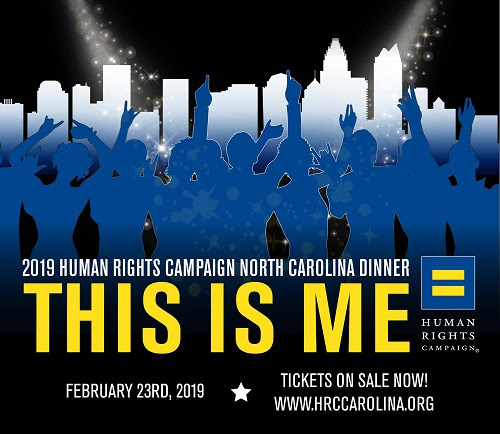 Take Action Today: Help keep the fight for EQUALITY going strong by supporting the 2019 North Carolina Gala in one of the following ways! Table Captains are the Gala’s best resource for success. Invite your family, friends, co-workers, and neighbors to hear our message of equality and encourage them to join us in our fight. As a Table Captain, you will receive insider news about guests and speakers, fabulous auction items and other dinner details. Email Lee Robertson at tablecaptains@hrccarolina.org for more information. Corporations that take a stand against hate that ensure the success of our event. Your company can demonstrate its commitment to the fight for equality while exposing your brand to an audience of loyal consumers. For more information emailsponsor@hrccarolina.org. The silent auction at the HRC North Carolina Gala is an ideal way to showcase a product or service to the audience for the event. Our silent auction committee will beautifully merchandise your donation for maximum traffic at the event ensuring that it is a not to be missed item! Email us at silentauction@hrccarolina.org for more information. Advertise your LGBTQ friendly business, church or social group in our keepsake program book that is given to our gala attendees. You can also announce weddings, engagements and send congratulatory messages. Advertising opportunities range from full-page to business card sizes. A digital download of the Program Book will also be made available on the HRC Carolina website. For ad sales information email us at ad@hrccarolina.org. Volunteers help us build every element of the North Carolina Dinner and have a blast at the same time! No matter what your skill set is, we have a volunteer opportunity for you. Email us at volunteer@hrccarolina.org to get involved!